Dwarf hair grass (Eleocharis acicularis) is a popular aquarium foreground plant often used in aquascapes to create a grass-like carpet look. It's decorative, not too difficult to grow and shrimp love it. 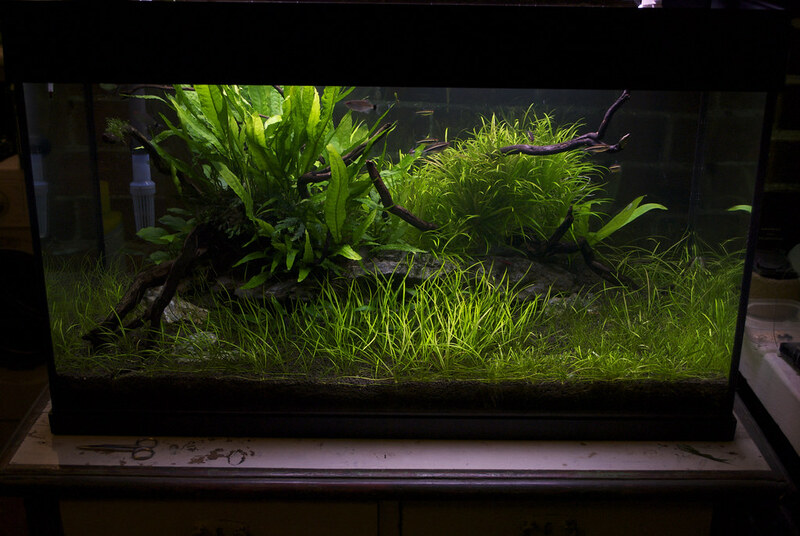 You can keep it short by trimming regularly or let it grow tall to provide your shrimp with a great place to hide and forage. You can even grow it emersed! Keep reading for everything you need to know about Eleocharis acicularis care and growing Eleocharis acicularis in your own (shrimp) aquarium. Like many other carpeting plants, Eleocharis acicularis does have some requirements. If these aren't met, the plant will quickly start losing its shape or fall prey to algae, which can quickly cover and suffocate it. This leads to brown patches and very slow growth. To keep your Eleocharis acicularis looking its best, provide medium to high light. In low-light conditions it will start to etiolate and grow too tall to work as a carpeting plant. Extra nutrients in the form of root tabs, Co2 and liquid plant food are definitely appreciated. Be sure to keep an eye out for any deficiencies by regularly testing your water. Keep in mind that very fine sand or very coarse gravel aren't ideal for this plant: a coarse sand works best and allows the roots to take hold and spread quickly. Regular trimming is a must with any carpet plant and this is no different for Eleocharis acicularis. Cutting the tops of the leaves helps it maintain its grassy look and actually stimulates new growth. If you want to expand your carpet you can always separate a few clumps and replant them in different places - this plant will spread by itself but it can take a while before it covers the entire bottom! As discussed above, Eleocharis acicularis is usually used as a foreground plant. Its grass-like look and creeping growth pattern make it a striking carpeting plant. If you prefer the overgrown jungle look over the meticulously maintained carpet style you can also let it grow free and tall by only trimming once in a while. Eleocharis acicularis isn't actually strictly an aquatic plant; it can also be grown emersed. This makes it a great option for paludariums that have part of the plants growing above the water line. Its abundant needle-like leaves make Eleocharis acicularis a great choice for shrimp aquariums. Both small fry and adults will appreciate being able to use the leaves as a hiding place and will gladly forage on the infusoria that grow on them. Because this plant can handle a very wide temperature range it's suitable for use in coldwater aquariums. If you aren't using a heater and are looking for a carpet plant, this might be the one for you! Aquascaping - Eleocharis acicularis looks great when combined with taller (stem) plants. Many aquarists also use it in combination with one or more other foreground plants for a little extra variety in textures. Hydrocotyle verticillata (whorled pennywort) is an example of a foreground plant that looks great when combined with dwarf hair grass. When buying dwarf hair grass, keep in mind that, like many other aquarium plants, it might not always be labeled correctly. For example, Eleocharis parvula is another aquarium plant commonly known as dwarf hair grass and the scientific names are often used interchangeably. Luckily this isn't much of a problem unless you're really set on one particular hair grass type, as care requirements are pretty much the same. 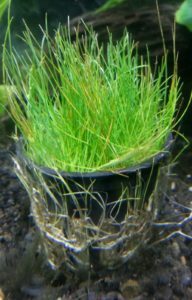 You can find dwarf hair grass in most aquarium stores. You can also buy it online at The Shrimp Farm! Just order here and we will ship it right to your doorstep.